If you want to build a successful digital marketing campaign, you’ll need to step out of your comfort zone and think out of the box. I’m not talking about reinventing the wheel, but rather about finding the right inspiration, strategies, and twists to effectively communicate your messages to your unique audience. Big brands like Dollar Shave Club, Dove, and Old Spice are pumping millions of dollars into their digital marketing campaigns. Whether it’s a big-budget video ad, a strong influencer marketing campaign, or a well-prepared social media strategy, every marketer should pay attention to what these brands accomplish (and how they accomplish it). Nevertheless, very few businesses can afford running million dollars campaigns. Even if you can deploy a big budget, it doesn’t mean you should waste it all on expensive advertising that involves media buying, TV ads, or other incredibly pricey marketing operations. Instead, you should tap into the huge potential that social media networks like Facebook, YouTube, Instagram, Snapchat, Twitter, and Pinterest can offer, and build amazing (and cost-effective) marketing campaigns. Promoting your brand through social networks involves knowing your target audience well, it involves creativity, out-of-the-box-thinking, consistency, and perseverance. More specifically, the better you understand what your prospective customers want and need, the more effective and the less expensive your social media campaigns will be. In today’s post, we’ve compiled five insightful social media marketing campaigns that should inspire your future digital marketing attempts. Regardless of your budget, you can develop a viral social media campaign that’ll skyrocket your brand’s reach and performance. Pay attention, take some notes, and find the proper twists for your own business! Here’s a successful e-commerce brand that doesn’t shy away from sharing their profits with charitable causes. iHeartDogs is a company that sells a variety of dog items such as collars, treats, bracelets. This is not just a regular e-commerce site but rather a dog lifestyle platform that is dedicated to dog lovers and altruistic individuals. On Black Friday, most companies offer terrific discounts. Well, not this company. 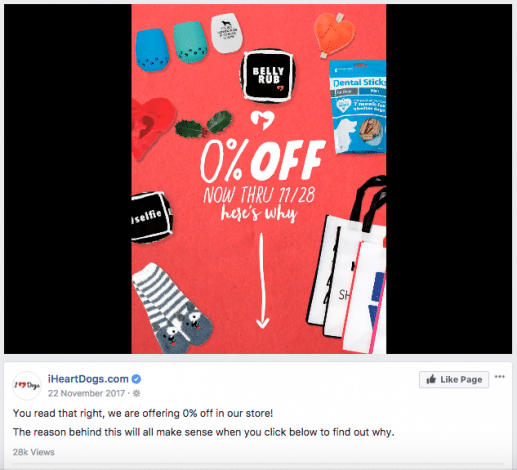 Instead of approaching the traditional way (discounts) to boost their sales, they have grabbed the attention of the masses by launching a 0% off campaign. Their ads were letting their followers and prospects know that instead of offering discounts, they would double up the donations from the sales made over the Black Friday weekend. They even had a well-established goal, and that was to offer more than 100,000 meals to shelter dogs in need. Not surprisingly, their campaign was successful: they managed to double their goals and send 200,000 meals. Their ads had links to an explainer article that provided more details about their campaign. Leveraging your brand’s unique value proposition is a great way to improve customer’s loyalty. Creating a campaign that serves the greater good is a truly effective way to capture people’s attention. Have a good reason and do something that nobody expects. Also, don’t forget to provide all the details! Leverage quality pictures to show professionalism and drive attention. Show passion and you will be greatly rewarded. If you’ve never invested, understanding terms like “robo-advisor” or “fintech” might be difficult at first. WealthSimple, a Toronto-based investment company keeps the concepts simple, offering their millennial audience down-to-earth explanations and educational resources that’ll take them one step closer to making their first investment. This company is spectacular when it comes to approaching and addressing their clearly defined target audience (27 old millennials), managing to capture their prospects’ attention using a simple yet effective communication style which creates a strong rapport and a feeling of trustworthiness. As for their social media strategies, they use the quality and simplicity approach. A particular social media campaign named “#InvestingForHumans” has made a lot of buzz, even though their campaign was a bit unusual for a financial firm. The firm interviewed hundreds of people, asking about money challenges and problems. Instead of doing a “cheap job,” they’ve hired expensive talent to create a high-quality short film that illustrates honest money stories from random individuals. Instead of capturing technical explanations about investing, the filmmaker managed to capture real emotions and perspectives about money from ordinary people. Not celebrities, not customers, just random individuals. Some of them were caught off-guard, and that was perfect for the campaign. What WealthSimple is trying to convey through this campaign is that regardless of your circumstances and financial problems, investing right now instead of “fooling around” with your money is the best way to ensure a long-term financial stability. Of course, the company is offering exactly the solution people might be looking for after they’re done watching the video. Instead of always trying to sell your products or services, sell ideas that are related to them. Use appropriate language that your target audience is familiar with. Being creative and developing out-of-the-box campaigns that defy the standard norms of your niche can boost your brand’s awareness and followers’ loyalty. High-quality videos work well. WealthSimple got over 1,800,000 YouTube views in only 5 months. Leverage more social media networks and channels of distribution (e.g., TV) to reach your target audience. Investing in paid advertising is often necessary to spread the word about your work and make your content viral. A fashion company that presents the latest trends in womenswear and menswear can always benefit from a carefully crafted social media campaign. ASOS, an e-commerce platform dedicated to young and creative individuals is doing an exceptional job on social media. Their campaign involves a user-generated content strategy that does not only encourage true engagement but also helps their most loyal brand advocates to display their appreciation of the company by sharing their quality products on their own social feeds. #AsSeenOnMe is one of the company’s most successful social media campaigns. “Tag your looks #AsSeenOnMe to get featured” – simple, concrete, and exciting. 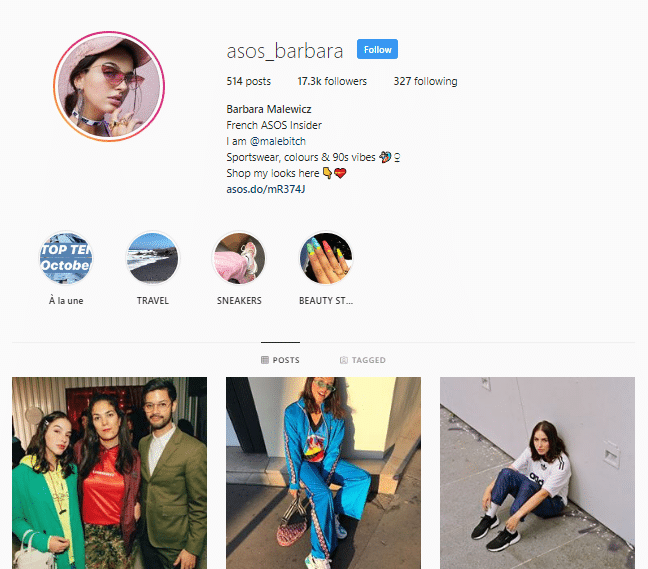 If you buy a product and you don’t mind taking a picture of yourself wearing ASOS’s outfit while inserting their #hashtag, you get the chance to be featured on the fashion brand’s Instagram feed. This will get you a lot of exposure and will help you build your own following. The exceptional part is that their UGC strategy aims to reach small influencers who would do anything to get more social media fans. Therefore, the opportunity to get featured on one of the biggest fashion websites worldwide is a great incentive to buy products, shoot of a photo of them, and tag ASOS using the campaign’s specific hashtag. Besides the huge promotion that comes with the #hashtag movement, the company is also effectively promoting their products that people showcase in their tagged photos. If you pay attention to the captions, the post provides a short description of the jumpsuit that the girl is wearing, and an identification number (1228608) that helps people find the specific product in a matter of seconds. If that wasn’t enough, they’ve even developed a special page that features all the products that are part of the #AsSeenOnMe campaign. Lastly, ASOS is such a great example because they truly know how to leverage the power of influencer marketing. 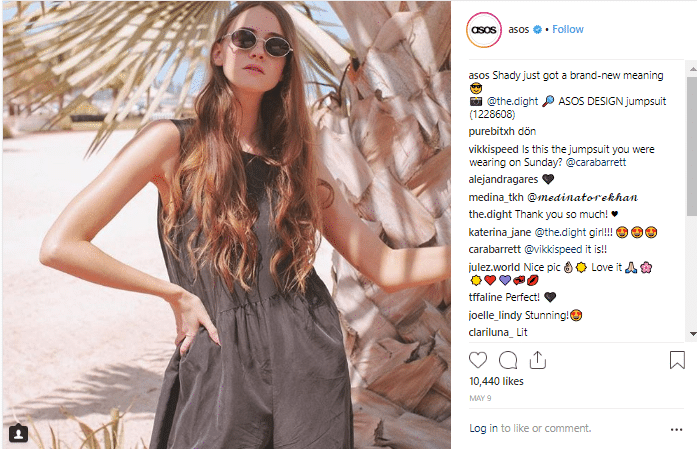 They have developed a different type of campaign, called “ASOS Insiders,” and it involves a collaboration with reputable influencers that get paid to promote the fashion brand’s products. All their “inside influencers” can be easily identified as they’ve modified their Instagram bios and handles to promote ASOS accordingly. User-generated content will help your brand get quality, targeted, and engaged traffic. If leveraged properly, it will also skyrocket your company’s sales. Instead of focusing on making more money through transactions, pay attention to your audience’s needs and develop a long-term relationship that’ll benefit both you and your brand’s advocates in the long term. Use influencers to boost your brand’s awareness, product sales, and social media engagement. Use branded hashtags (and monitor them) to track your user-generated content campaigns. Our next successful social media example comes from WayFair. We’re talking about a company that sells furniture, cookware, lighting, and other household. A big chunk of the company’s audience spends time on Instagram. When Instagram added new shopping features in 2017, one of the toughest challenges for retailers became possible. The biggest problem retail brands were facing was the bridge between their Instagram’s photos and their products. People used to like, comment, and share, but most of them would not order products. This has changed, as now customers are able to shop directly through Instagram. Nowadays, brands are able to tag their products within their photos, add links, and prices. If a user clicks on an item featured in a photo, he’ll be redirected to a landing page that allows him to purchase the item in a matter of seconds. 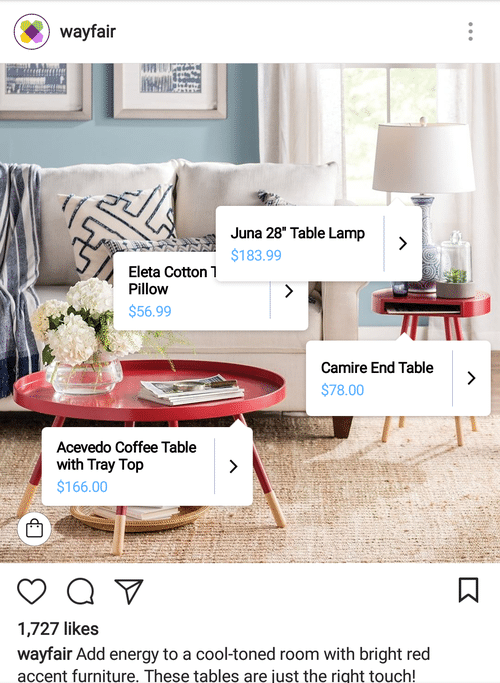 WayFair acknowledged and started to leverage the power of Instagram shopping, and began creating quality pictures of their products and tagging them within their posts. A picture features four different yet truly related products that come with different prices. A short and relevant description, and voila. The products are ready to be ordered and shipped to the people who want them. 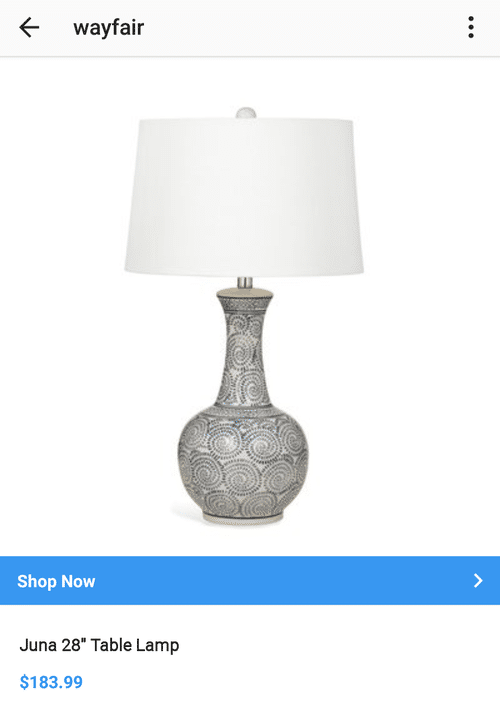 Once you click the “Shop Now” button, you’ll be taken to WayFair’s website, where the product you’re seeking is ready to be bought. Why is this process so effective? Because that’s exactly how WayFair’s target audience wants to shop. Instead of going through long funnels, they’d rather make a few clicks and buy, without prolonging the process. By focusing on improving the customer’s shopping experience, online brands can only gain significant benefits. Be the first who implements the newest social media features, be bold, and the rewards will eventually show up. Develop high-quality content. For example, instead of hiring cheap writing services, seek talented non-agency freelancers who understand your brand’s needs, culture, and objectives. 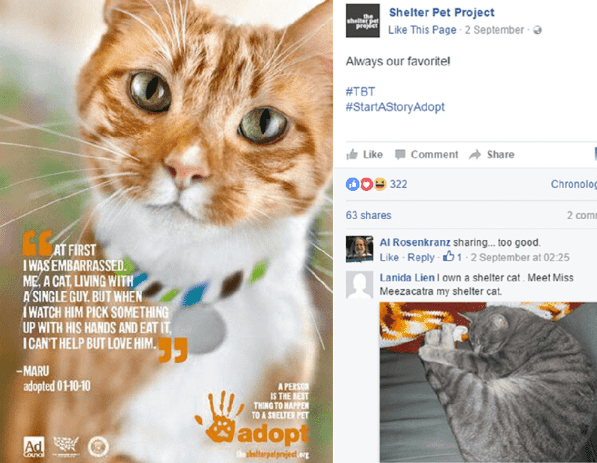 Even though Shelter Pet Project is a non-profit organization, they’re killing it on social media with their powerful campaign strategies. Being a pet rescue center and service, their main goal is to find loving families for the dogs and cats they have rescued. Their strategy is to make people fall in love with the rescued animals, aiming for people’s soft emotions like pity, compassion, sensibility, and so on. To draw people’s attention, they’re developing amazing stories and using them to promote the animals. These stories simply can’t be ignored, as they’re powerful, heart touching, and often heart breaking. This non-profit organization has mastered the art of storytelling. Social media is the best place to touch people’s hearts while asking them to contribute to the greater good and save innocent lives. 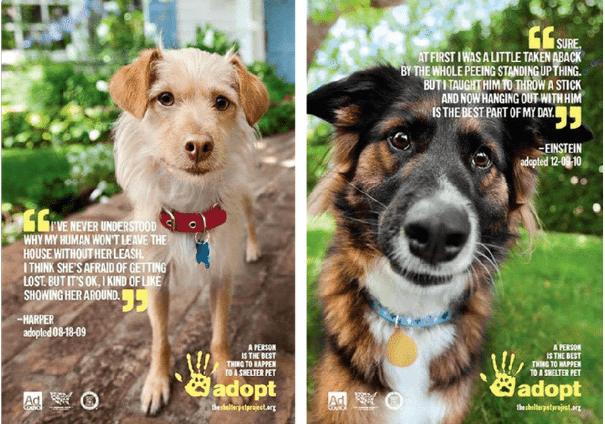 Every featured animal has a name, a story, an adoption status, and a strong CTA (call-to-action) which basically asks people to go ahead and adopt. Storytelling is a powerful marketing strategy that can be adopted with any type of products (not just animals). Touching people’s feelings and “soft spots” is an incredibly effective way to motivate them to act. Adding an entertaining and unique voice to your social media posts is a great way to keep your followers’ engagement on the rise. High-quality visual content will frequently trigger the attention of your prospects. Developing and running an effective social media marketing campaign is not easy, but far from impossible. As the adage goes, “There’s nothing new under the sun,” so instead of striving to be 100% original, focus on crafting something unique. The secret key is to learn how to communicate with your social media followers, prospects, and customers. Before you begin, make sure you study other successful social media campaigns and collect all the relevant ideas, strategies, and twists you can find. Susan Saurel is a passionate writer from Texas. Teacher of higher category, PM in an IT company, loving mom, and a persistent traveler, content writer for EssayWritingLand. Susan is ready to share her experience with her readers, and she has something to say, for sure. Get in touch with her via Twitter.